Lexpert magazine features articles and columns on developments in legal practice management, deals and lawsuits of interest in Canada, the law and business issues of interest to legal professionals and businesses that purchase legal services. 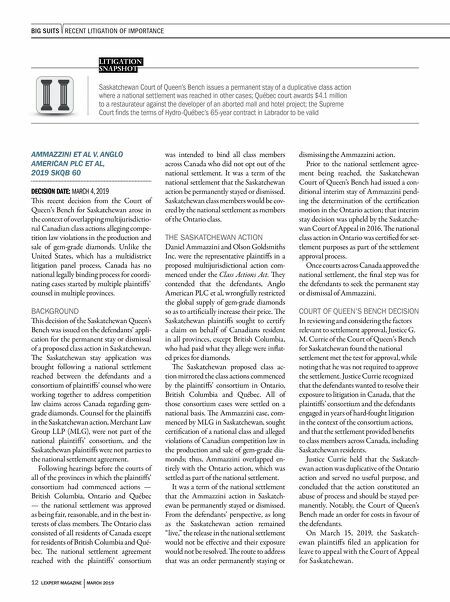 LEXPERT MAGAZINE | MARCH 2019 13 e significance of the Ammazzini deci- sion lies in the willingness of the Saskatch- ewan court to tackle the vexing problem of overlapping class actions and to accept a practical solution to the lack of a formal process to resolve multidistrict class action litigation in Canada. is decision is im- portant to the class actions bar, as well as to members of the judiciary who are called upon to manage overlapping multijurisdic- tional class actions in Canada. Katherine L. Kay, Danielle Royal and Sinziana Hennig of Stikeman Elliott LLP represented the defendants, Anglo American PLC and De Beers Canada Inc. E. F. Anthony Merchant, QC, and Iqbal Brar of Merchant Law Group LLP acted for the Saskatchewan plaintiffs. David G. A. Jones and Naomi J. Kovak of Camp Fiorante Matthews Mogerman LLP acted for Ontario plaintiff Kirk Brant. BROCCOLINI LIMITED PARTNERSHIP 1 V. RESTAURANT LOUPY'S INC., 2019 QCCA 297 DECISION DATE: JANUARY 29, 2019 A catering franchisee — Gilles Lupien, a retired NHL player — was ultimately successful in a multimillion-dollar lawsuit against a real estate developer. e developer had proposed that the franchisee build and operate a restaurant as part of a new commercial development in west suburban Montréal, which was to include a commercial mall and a hotel. e contract between the franchisee and the developer, signed in December 2007, provided that the franchisee build the res- taurant and then operate it under a lease with the developer. e franchisee built the restaurant as agreed, but neither the com- mercial mall nor the hotel were developed. In its December 2016 judgement, the Québec Superior Court held that such conduct by the developer was an of abuse of rights and breach of the rules of good faith in contractual matters. is lawsuit also dealt with the applica- tion (or non-application) of "entire agree- ment" clauses generally contained in com- mercial leases. In this case, the context for the signing of the lease was important, as representations had been made before and aer signing that a commercial mall and a hotel would be built. Ultimately, the Court considered the wording of the lease am- biguous given that certain of its provisions could be read as if the mall and hotel had been built. e "entire agreement" clause was thus tossed aside by the Court, which then applied the rules of interpretation and considered the context, including precon- tractual representations. e Court held that the developer's conduct amounted to misrepresentation and breach of its duty to act in good faith. e lease was annulled and the franchisee was ultimately awarded $4.1 million in damages and interest. e developer's appeal of the decision was rejected by the Court of Appeal of Québec. e plaintiff/respondent, Restaurant Loupy's Inc., was represented by Frédéric Paré, Maude Brouillette and Marjorie Bouchard of Stikeman Elliott LLP. Jacques S. Darche and Marie-Claude Lassiseraye Mathieu of Borden Ladner Gervais LLP acted for the defendants/ap- pellants, Broccolini Limited Partnership 1 and 6750923 Canada Inc. CHURCHILL FALLS (LABRADOR) CORP. V. HYDRO- QUÉBEC, 2018 SCC 46 DECISION DATE: NOVEMBER 2, 2018 At the Supreme Court of Canada, Hydro- Québec was successful in defeating a claim brought by Churchill Falls (Labrador) Corporation Limited (CFLCo) seek- ing to increase the price paid by Hydro- Québec for electricity purchased from the Churchill Falls Power Plant pursuant to a 65-year contract entered into in 1969. A judgment favourable to Hydro-Qué- bec was rendered by the Québec Superior Court in 2016. CFLCo's appeal before the Court of Appeal of Québec was heard on December 5, 2017. 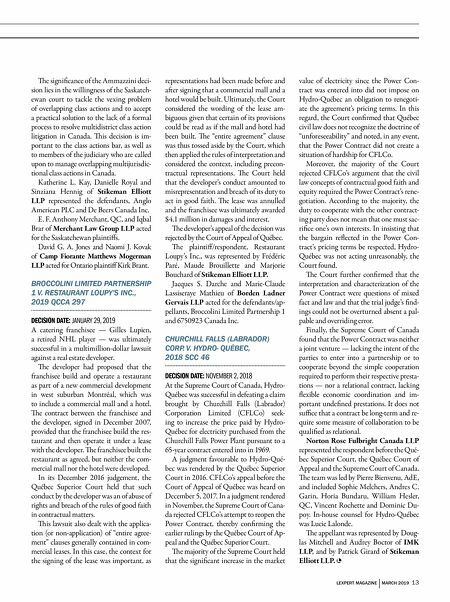 In a judgment rendered in November, the Supreme Court of Cana- da rejected CFLCo's attempt to reopen the Power Contract, thereby confirming the earlier rulings by the Québec Court of Ap- peal and the Québec Superior Court. e majority of the Supreme Court held that the significant increase in the market value of electricity since the Power Con- tract was entered into did not impose on Hydro-Québec an obligation to renegoti- ate the agreement's pricing terms. In this regard, the Court confirmed that Québec civil law does not recognize the doctrine of "unforeseeability" and noted, in any event, that the Power Contract did not create a situation of hardship for CFLCo. Moreover, the majority of the Court rejected CFLCo's argument that the civil law concepts of contractual good faith and equity required the Power Contract's rene- gotiation. According to the majority, the duty to cooperate with the other contract- ing party does not mean that one must sac- rifice one's own interests. In insisting that the bargain reflected in the Power Con- tract's pricing terms be respected, Hydro- Québec was not acting unreasonably, the Court found. e Court further confirmed that the interpretation and characterization of the Power Contract were questions of mixed fact and law and that the trial judge's find- ings could not be overturned absent a pal- pable and overriding error. Finally, the Supreme Court of Canada found that the Power Contract was neither a joint venture — lacking the intent of the parties to enter into a partnership or to cooperate beyond the simple cooperation required to perform their respective presta- tions — nor a relational contract, lacking flexible economic coordination and im- portant undefined prestations. It does not suffice that a contract be long-term and re- quire some measure of collaboration to be qualified as relational. Norton Rose Fulbright Canada LLP represented the respondent before the Qué- bec Superior Court, the Québec Court of Appeal and the Supreme Court of Canada. e team was led by Pierre Bienvenu, AdE, and included Sophie Melchers, Andres C. Garin, Horia Bundaru, William Hesler, QC, Vincent Rochette and Dominic Du- poy. In-house counsel for Hydro-Québec was Lucie Lalonde. e appellant was represented by Doug- las Mitchell and Audrey Boctor of IMK LLP, and by Patrick Girard of Stikeman Elliott LLP.